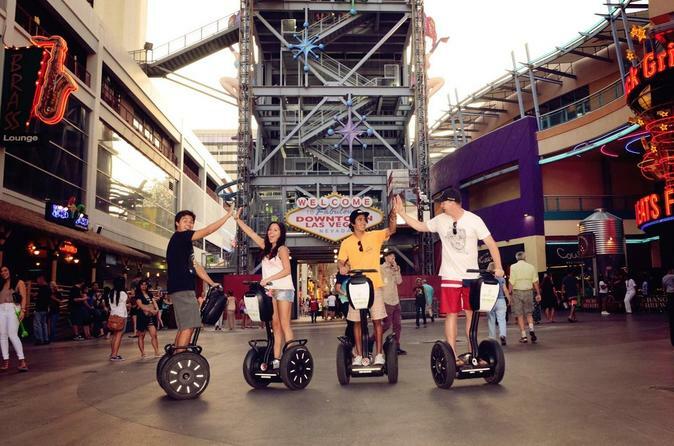 Glide throughout the heart of Downtown Las Vegas on this 2-hour Historic Famous Las Vegas Tour! This experience features guided narration with individual headsets for each guest and fits perfectly into any morning or afternoon to turn a good vacation into an amazing one! From History Channel's "Pawn Stars" Gold & Silver Pawn Shop to The Mob Museum and everything in between! Hear the inside scoop, learn little known facts and see all the sights of Downtown that has made Las Vegas famous! There are walking tours and there are bus tours, but this unique Segway tour provides an entirely new practical perspective & covers a lot of ground in a small amount of time. This 2-hr guided tour takes off directly from the 18b Arts District. Just minutes from the heart of Downtown Las Vegas and all that has made it a popular attraction. Before your tour, you'll go through a brief yet thorough training and with that out of the way, it’s time to hit the road! Tour highlights include the Gold and Silver "Pawn Stars" Pawn Shop, Fremont Street Experience, Container Park, the amazing Art District full of one-of-a-kind amazing murals, The Mob Museum and much more! Full of information, little known facts, and tons of inside knowledge -each tour has the potential to be different but all tours include photo ops, fascinating tales of the most iconic locations in Downtown Las Vegas, tons of Segway smiles & memorizes that last forever. Come glide with us!